Saw this one at the Hyperdome while doing my Xmas shopping. Well talking about seeing 19 or so yesterday Terry, i believe i saw the same ones, today i was down spudie's way for work and came accross 8 mokes and the n one up in berwick. Too much to do not enough time or money! 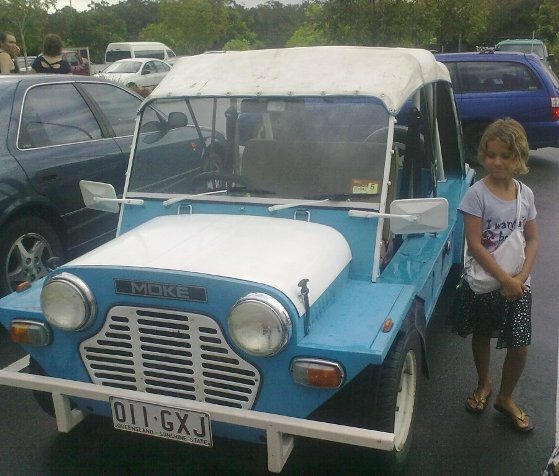 I have been in Cairns for the last 5 Nights and spotted a red moke a couple of times. Had cowprint covers? on what looked like Tombstone seats, I couldnt tell clearly as we kinda hurtled past in a taxi. Number plate was ***.ILU? or similar. First was on Saturday 9th it was parked on Sheridan St outside the shops at around 4pm and then again driving along Gaton Rd about 12.45pm on Sunday. I meant to start a thread and see if any Cairns locals were busy last weekend and available to meet up and possibly take us for a proper drive around Cairns. Maybe next time. Managed to snap a photo of the blue Moke on the Gateway this morning. I think TLP said his name was Rob from redcliffe. Rob - if your listening, it was me blowing my horn at you this morning. 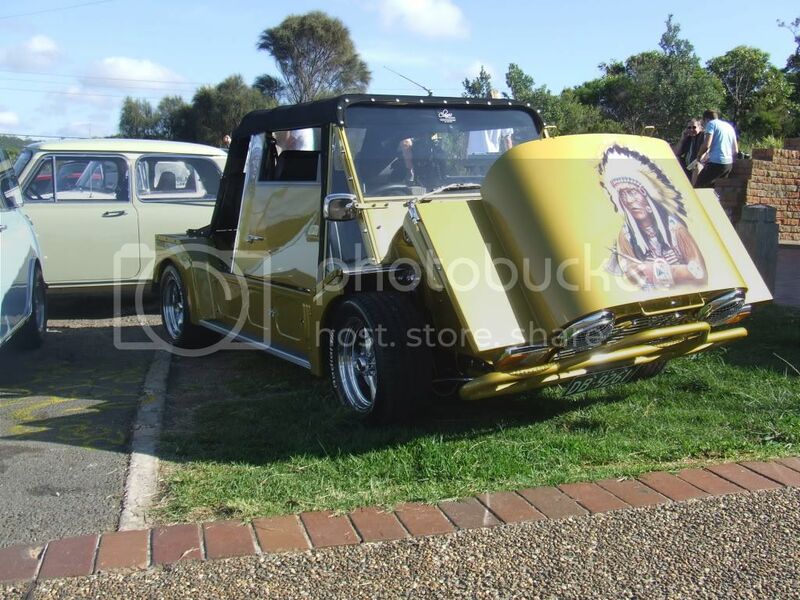 Just passed a nice fresh looking Yellow Moke in Whittlesea today. 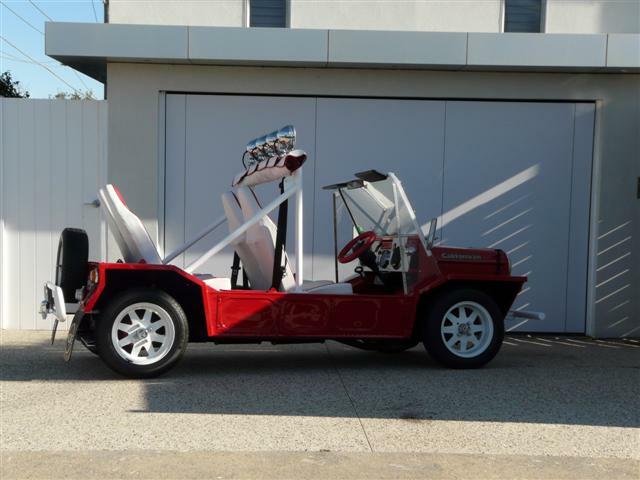 Had no canopy or much else and I don't recall noticing a rego plate on it either. I think it had some old Mini World mudflaps on it though. out of the corner of my eye so I slammed on the anchors and walk over to it parked in the service road. back which he had at MokeFest. 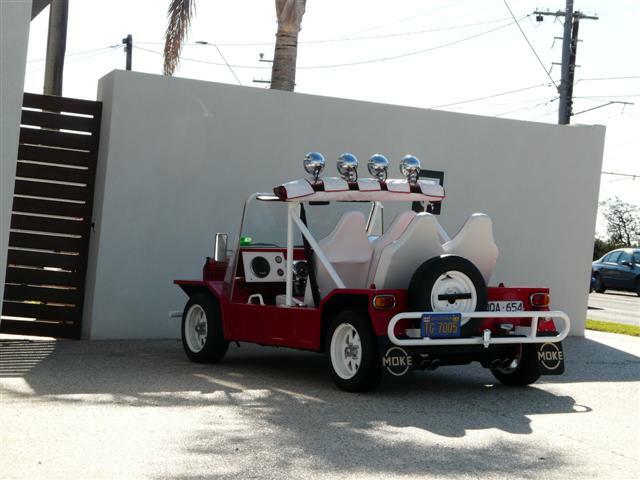 Bronta was last seen heading to Williams house so Dave can marvel at Williams handy work. Sorry, no camera, no pictures. It was good catching up with Dave and William, I had to leave as I had a dinner date. Spotted this bad boy on Friday afternoon driving around the corner from my house. I remember there being a thread on it but couldnt find it. It now has the plates 'MOKEME' or close to that. If I was in the position to follow and make contact i would have but was in a rush. Does anyone know where the new owner lives? Have been in North Queensland for the last couple of weeks on hols. Saw a nice gold coloured one in Port Doulas where we were staying. Went to get camera but was too late. Same with a maroon one in same place but went back with camera and it was gone too !! Saw a blue one in the distance in Charters Towers also. 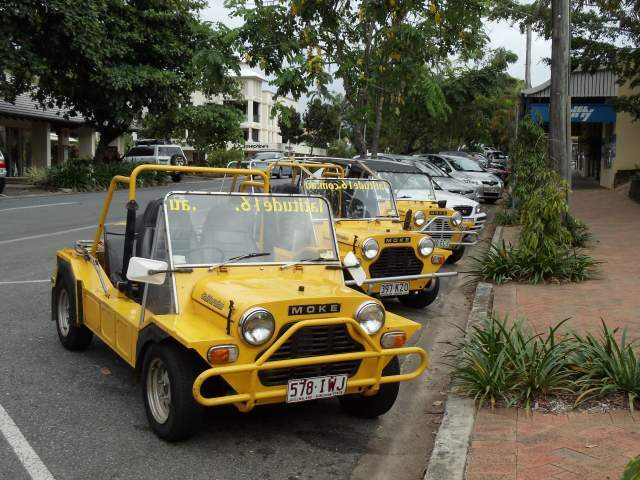 These were for hire in Port Douglas. Wanted to go over to Magnetic island to have a look at their collection but didn't make it. Where do all the little tubes go from CRC can ? 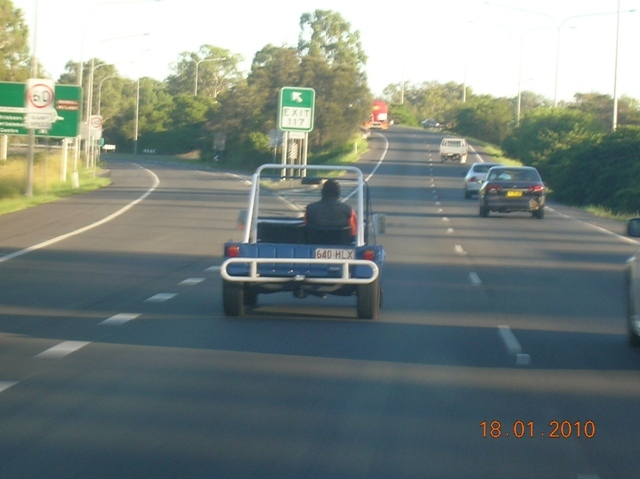 Passed a blue moke on the Gateway today - not one I have seen before. 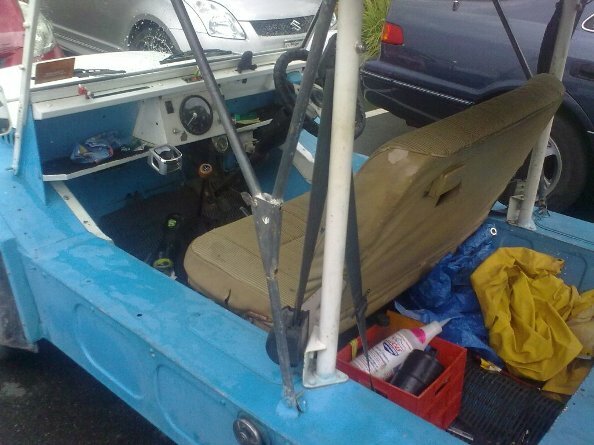 Sticker on the bonnet "bluebeast"
Spotted a white moke on the back of a truck heading south on the monash near the sth gippy turn off. 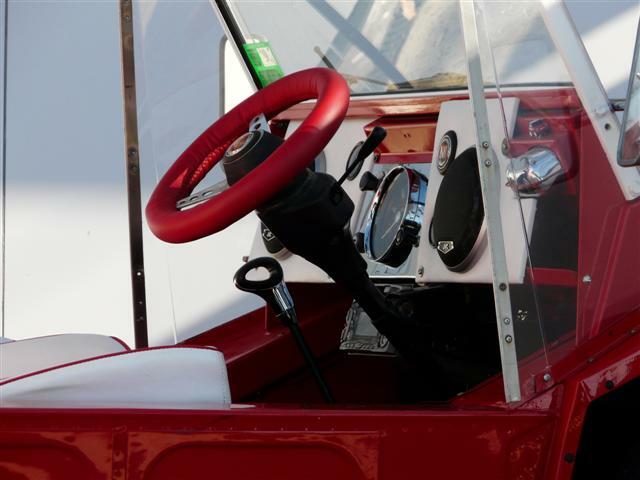 Did you buy another moke Moe! It had qld rego 836 lag. Full hood and had shinny hub caps. 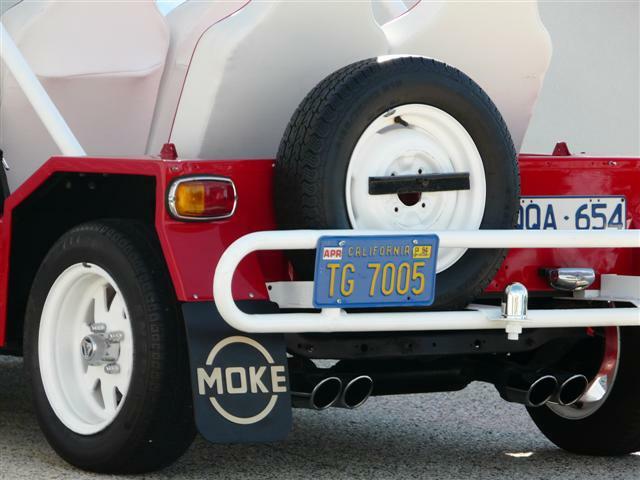 What makes a Moke Ute a Moke Ute?